Contact lenses are very safe if worn properly. While contacts are designed to be worn for long periods every day, there are certain times when you should remove them. Contact lenses should be removed before coming into contact with any water, including shower water. Leaving your contact lenses in while showering may be more convenient, but doing so can lead an infection that may cause pain, visual impairment and blindness. Shower water can contain acanthamoeba, a microscopic organism that occurs naturally in the environment. It can live in sea water, lakes and rivers. It can also live in tap water that comes out of sinks and shower heads. While acanthamoeba rarely causes illness, it can cause an infection. Acanthamoeba keratitis is an eye infection caused by acanthamoeba, which makes its way into the eye through water. Acanthamoeba keratitis most commonly occurs in contact lenses wearers. Showering with contact lenses increases the risk of infection because the lenses can trap water containing the organism. Once acanthamoeba is on the eye, it releases proteins that dissolve the cornea, the outer layer of the eye. It then invades the cornea and starts eating the corneal cells and the eye's naturally occurring bacteria. The early symptoms of acanthamoeba keratitis include redness, blurred vision, eye pain, excessive tearing, sensitivity to light and a feeling that there is something in the eye. If left untreated, acanthamoeba keratitis can lead to severe pain, permanent vision impairment and even blindness. Anyone with these symptoms should see an ophthalmologist immediately for evaluation and treatment. He will diagnose the infection by taking a scraping of the eye and/or through a confocal microscopy. One or more prescription medicines are usually needed to treat the infection. 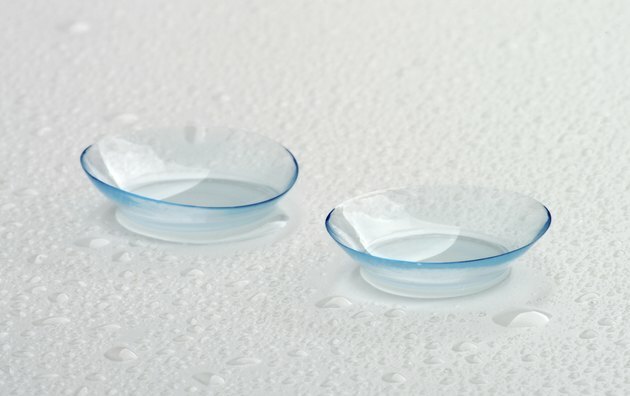 To prevent the chances of getting acanthamoeba keratitis, remove your contact lenses before coming into any contact with water, especially before showering. Keep a pair of eyeglasses nearby if you cannot get in and out of the shower safely without corrective lenses. Eyeglasses can be made with anti-fog coating; a less expensive option is spraying them with an anti-fog spray.